Fashion has been having a "pretty" moment for the last few years (which I guess would make it more of an era), so before we get all somber and serious for fall, girly is getting one last hurrah for spring with eyelet. Fewer fabrics are frillier, but as long as you stay away from ruffles, eyelet actually looks quite modern. Also, it's great for summer, because it's like having built-in air-conditioning! Another plus is that since eyelet is typically made of cotton, bargains abound, but you can also go luxe if you so choose. This much-knocked-off wrap dress is so timeless, it won't even matter if eyelet isn't "in" for the season. So while there are many imitators, I truly believe that there's something magical in the cut of DVF's wrap dresses, such as this lovely Eyelet Bellette Wrap Dress. Amazing construction (inner corsetry!) with a built-in patent leather belt means this strapless eyelet number from Carolina Herrera is anything but prissy. Can't you see Renee Zellweger showing up to her next premiere in this delicious dress? For those of us who ride the subway every day, dry-cleaning all that white eyelet can be a daunting task. Thankfully, eyelet doesn't always have to be white. This Burberry skirt is still sweet, but with a practical side, in dusty olive. I remember Milly's '60s eyelet shift from the runway show, and lo and behold, here it is. It reminds me of something Mia Farrow would've worn in the late '60s, circa Rosemary's Baby, youthful but not childish. For a traditional, flattering fit, you can't go wrong with Nanette Lepore's Ahoy There eyelet dress, which, even with its cutout in the back, is bra-friendly. Were it not for the don't-wear-white-to-a-wedding rule, this would be a perfect summer-wedding dress. Considering I've already seen it at five stores, I think it's safe to say you're going to see this Vince Laundered Eyelet dress everywhere this season. But with its chic shape, comfy fit and soft feel, I think that's a good thing. It might just be the perfect summer dress. 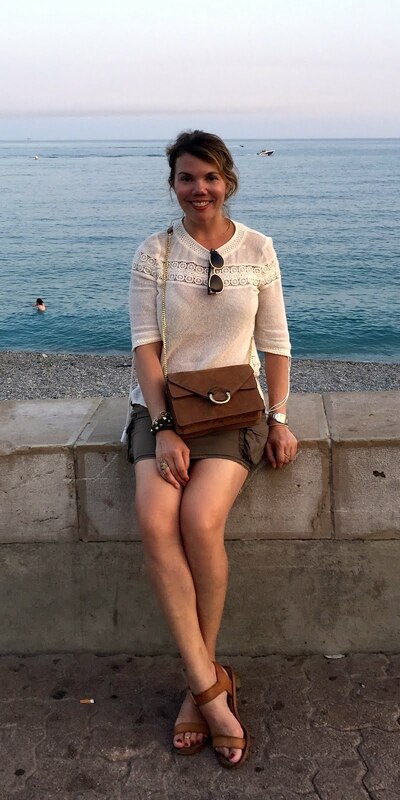 Of course, there are other ways to wear eyelet. 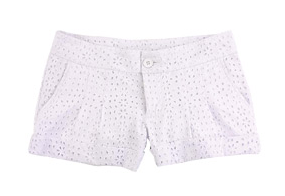 If you've got the gams, for example, you can rock this super-short Paulette Eyelet Short, which I think is cute and unexpected. 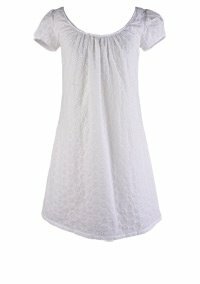 This babydoll dress from Roxy comes in yellow, black and white, and combines knit with eyelet to give it a more fitted silhouette. A budget version of the Vince style, this sweet eyelet shift dress is clean, simple, and a mere $40. Please look at how cute this is. Eyelet Bustier in white from OnGossamer. It can be dressed up or down so easy. I love it.